Follow the itinerary below for a perfect five days in Barcelona! If you want to mix it, try and pick and choose 2 touristy things per day and mix it in with lots of plaza people watching, eating and drinking! Bari Gotic Walking Tour: My Mom was nice enough to print us out some copies of Rick Steve’s walking tours and after waking up we took off to explore the Barri Gotic area and the El Born neighborhood. This charming neighborhood is filled with narrow cobblestone streets that offer you a true glimpse of what Medieval Barcelona once was. Our Rick Steves tour directed us into both populated areas with shopping and restaurants along with several quiet plazas for a delightful place to sit, have a snack and relax. Lunch and dinner: We couldn’t wait to get our hands on some tapas for lunch and picked a place that we later discovered had multiple locations around the city called Taller de Tapas. They had a great €10 lunch deal that we couldn’t pass up. The food was pretty good and an excellent introduction to the tapas we’d be eating throughout our trip. My younger brother studied abroad in Barcelona and suggested we do dinner at Cerveceria Catalana, a well-known tapas bar frequented by tourists and locals alike. It was packed on a Saturday night and we just hung around the bar lurking behind other patrons until a couple got up and we snagged their spot. Now I’m not sure if it was just our first night, but the food here was some of the best we had on our whole trip and the atmosphere was not to be missed. Take a free Gaudi walking tour: After a late night out (we ended the evening at a little Irish pub next to our hotel), I was definitely struggling the next day as we made our way to Plaza Reial to meet our group for a free Gaudi walking tour by Runner Bean Tours. This awesome tour company offers some great tours for free, and you just tip at the end what you think it was worth. We’ve literally done free walking tours all over the world from New Orleans to Melbourne, Australia and highly suggest seeking one out no matter where you may be traveling. Gaudi’s influence can be seen all over the city, and we visited some of the main sites that he is known for on our tour including Casa Batllo, Palau Guell, Block of Discord, Sagrada Familia, Case Mila, and more. Explore Villa de Gracia: Our tour ended by the Sagrada Familia which wasn’t that long of a walk to what came to be my favorite neighborhood in Barcelona, Villa de Gracia. I loved the homey-feel of Barcelona’s first “suburb”, although it is really just a few train stops away from the city center. If we would have had a full week or more to settle in as Barcelona residents, this neighborhood would have been a great place to rent an Air BnB. The whole neighborhood is filled with sunny plazas, enticing restaurants and tiny tapas bars. We visited on a Sunday and I loved that all the local residents posted up in the plazas with a bottle of wine or a beer to just sit and talk with friends. We had lunch at a great little croquette place called Croque and Roll. Croquettes are little fried pieces of goodness often filled with a béchamel sauce and combined with cheese, seafood or meats. Make sure you don’t miss the calamari and squid ink one which was my favorite! Eat paella: That evening I had booked a reservation at what TripAdvisor ranked as one of the best paella restaurants in Barcelona, Elche. We arrived to the neighborhood a bit early and grabbed a bucket of beers at a local dive bar across the street. Now to give Elche some credit, we did dine on a Monday, the slowest day of the week in Spain, but the place was practically empty and the white table cloth atmosphere wasn’t exactly our scene. But to be fair, we came for the food, not the atmosphere and the paella did not disappoint. The dish came with a massive amount of seafood and the rice was perfectly al dente and crispy in just the right places. It was a bit expensive but the quality of the food was really top notch and in the end we were happy to have a real paella experience versus a pre-made version often served at the bars around town. Tour Sagrada Familia: We started the morning off by touring the inside of the Sagrada Familia. Normally, neither Jeremy or I are big audio tour fans, but it is a must do for this site. Designed by Gaudi (and considered his greatest work), the Sagrada Familia is the largest unfinished Roman Catholic Church in the world with two distinct facades. It’s really the most breathtaking piece of architecture I’ve ever seen and the inside is just as intricate and beautiful as the exterior. Each of the churches 18 towers has special significance. The middle tower is dedicated to Jesus Christ and it’s surrounded by four other towers representing the Gospels. The tower above the apse represents the Virgin Mary and the remaining 12 represent the 12 Apostles. Visit a local market: We planned to explore the Barceloneta neighborhood by the beach in the afternoon and began a mosey back through the Eixemple area guided by another Rick Steves pamphlet. Along the way we stopped for some Iberico ham and manchego cheese in the fairly empty Mercat de la Concepcio. It was a nice break from some of the heavier foods we’d been eating and provided the perfect excuse to pick a bench and watch the world go by while eating makeshift sandwiches. We liked this market because we were virtually the only tourists; it was a nice glimpse into how people who actually live here do their everyday shopping. Walk Las Ramblas and La Boqueria: We strolled along Las Ramblas, one of Barcelona’s main walking streets that we took pretty often to get around the city center and ambled into to La Boqueria Market which was filled with savory cones of meat, delicious smelling countertop restaurants, empanadas, sweets and more. It was fun to explore all the different stalls, but the food was either unoriginal or overpriced. 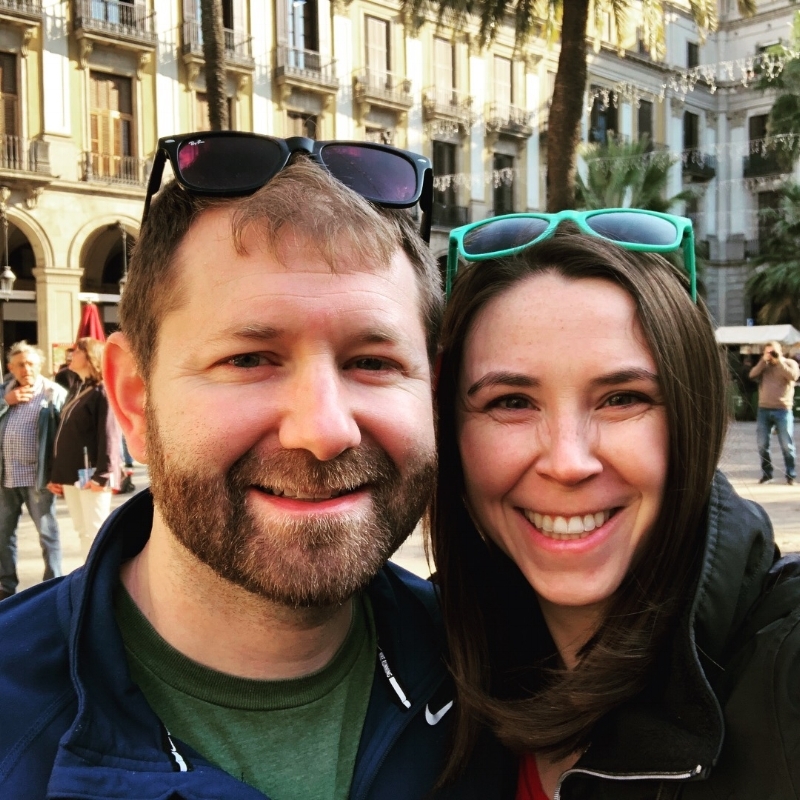 We may not be backpackers any more but it’s hard to leave that mentality, especially when there are so many great, and reasonably-priced food options in Barcelona. Explore the boardwalk and Barceloneta: We eventually made it to the seaside neighborhood of Barceloneta where we wandered along the boardwalk, stopping occasionally to view some of the intricate sandcastles that were set-up on the beach. Since we visited on the edge of winter it was a pretty quiet walk, but I can only imagine the type of scene it must be in the summer with the ocean-side clubs and bars. We also ventured into the local neighborhood and found a little square to munch on olives and a glass of wine whole observing the neighborhood’s residents pass through on their way home from school and work. Eat at Bo de B: We hit a bit of an odd hour when we were too far from our hotel to go home for a siesta and make it back out again later so we decided to have an early dinner at one of my brother’s favorite sandwich shops nearby, Bo de B, proceeded by a drink at a bar in the El Born neighborhood. My brother absolutely raved about the cheap sandwiches at Bo de B and I have to be honest, he was 100% on point. These were absolutely amazing and had some of the best toppings and sauces I’ve ever found at a sandwich shop. They were also quite massive so that we didn’t end up needing anything else for dinner that evening. Visit Parc Guell: I’d say that day 4 was probably our most touristy day on the itinerary so we got an early start with a visit to Parc Guell. Park Güell is a public park system with a variety of trails and gardens along with a monumental core designed by Gaudi. The original goal of Parc Guell was to be a high-end neighborhood for Barcelona’s aristocrats, but in reality, nobody really wanted to move there! Today is mostly serves as a regular park and tourist site that features some of Gaudi’s most colorful architecture. Visit Montjuic and the Olympic Stadium: After visiting Parc Güell we hopped back on the train to the opposite end of the line to visit Montjuic for an equally awesome view of the city and to see the 1992 Olympic Stadium which is free and open to the public. Montjuic is home to several sites and museums including a castle, which we didn’t end up exploring. We had heard the castle is mostly in ruins today and unless you choose to hire a guide, it mainly serves as a good view point of the city, which we found for free by wandering down a walking path after hopping off the bus. Explore El Born: In the evening, we went back to explore the El Born neighborhood at night and ended up eating at a tapas restaurant many people had recommended to us near the Picasso Museum called El Xampanyet. While the food was good, it wasn’t anything special. We would have loved to been able to explore the El Born neighborhood on a weekend in the summer as it was a little bit sleepy during the fall weekdays. Our last day in Barcelona was actually the last day of our trip (not connected to the four consecutive days above) that we returned to for one last day/night after visiting Madrid and San Sebastian. Visit Parc de la Ciutadella: We started our day at Barcelona’s Arc de Triumph and then strolled our way through the Parc de la Ciutadella. My brother said that he loved to just come hang out in this park with his buddies and people watch the day away and we could certainly see why with the plethora of characters. If you visit make sure you don’t miss the beautiful Cascada Monumental fountain hidden away in the corner of the park. (In winter) visit a Christmas market: After the park, we headed back to the Gotic district to check out Barcelona’s Christmas market. Visiting a European Christmas market has been on this Cashew’s (Catholic+Jew) bucket list for some time now so I was super excited that our very last day in Spain all the Christmas markets started to open! Most stalls sold bits and pieces for your nativity scene, but every booth and artist had a little bit different twist on it. This was also our introduction to Barcelona’s most famous nativity character, The Caganer, which roughly translates to “The Crapper”. Yes, a small little fellow squatting down taking a poo. The exact history is unknown but supposedly dates back to the 18th century. He really cracked us up! Don’t miss the Picasso Museum: Since our last day was a Thursday, I had scored us free tickets to the Picasso Museum during their special free timeframe. Besides the Van Gough museum in Amsterdam this was only my second visit to a museum dedicated to just one artist. Given that monumental amount of work that Picasso produced, one can understand why his works require a dedicated space. The museum was laid out according to his life from beginning to end and my mind was blown by some of his early works that were incredibly mature for an artist of his age. The museum itself is an old stone building in the heart of the Gotic district and is pretty cool architecturally on its own as well. With 5 days in Barcelona I’d say we did a pretty good job of packing in a good variety of activities, food, museums, and neighborhoods. There is certainly some wiggle-room in our itinerary to add more activities, make it more relaxed, whatever is your vision of a dream vacation in Barcelona!